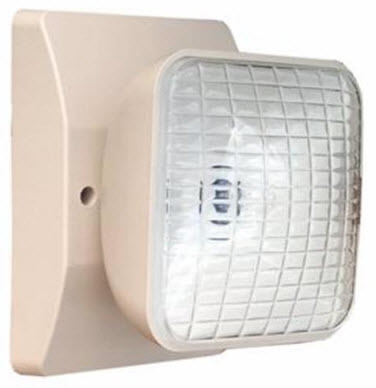 Single square remote emergency head fixture works with emergency lighting where it can be connected with a full emergency light. It's important to meet local codes for emergency lighting for the safety of people that use their building. - Supplied with 6V, 5.4W incandescent wedge base lamps. Emergency lighting is an essential part of any safe and secure building plan. Much of it is regulated by fire codes, and you should be aware of your local codes when installing these. You want to make sure that you have your exits appropriately covered with egress lighting so that people can get out in case of an emergency. If you're unsure of that, contact your local fire inspector, and he can help you determine what you need. If it's new construction, that will be specified by an engineer and done according to local codes that you may have. Just because it ’s a required type of egress lighting, doesn’t mean it has to be ugly. There are many good designs such as architectural emergency lights which can accent the look of your interior space and not detract from it. Lighting for emergencies started as a convenient form of light. In other words, people would put these on a wall, and when there were power outages, these would come on. They were often called bugeye lights because they usually had a couple of protruding lights out of the top. And although that same style is used today in many cases, some of it becomes streamlined so that it looks better when it is on a wall. Some building owners and property managers hate those bug eye lights not only because they can look like it was just stuck there, but also because they can be kind of a maintenance headache. It’s important to go through and have a scheduled test check of any of the emergency lights you have. It’s the only way to know if the battery has gone out and could no longer hold a charge. That’s the biggest consumable in any of these light fixtures. The bulbs that they may use if you have that type rarely go out. It’s the battery that wears out over time, and it’s essential to maintain that over anything else because that is what makes the safety of the unit. The good news is that some of the LED versions have less maintenance associated with them, but the battery is still critical. Keep your emergency lighting maintained. These are often used in conjunction with exit signs that have a battery backup as well. It’s a part of a complete system to help people get out during a fire or some other kind of emergency. Although none of these is maintenance free, the newer forms of LED emergency operate better than, the older incandescent style. We still have both of these available, and many people still like to match up what they have rather than go to something entirely new. We also have all the remote heads for different types of either emergency lighting or exit signs. Nothing is more critical than keeping all of this maintained sometimes and adequately if you have ancient emergency lights, it’s better to change them all at once instead of trying to support one piece here or there. If you do that, you can plan for battery changes on a regular basis so that you can keep your system up-to-date all the time and ready for any emergency you may have. Please call us or email us if you have any questions about your emergency lighting and any components that you need to keep it maintained properly. We have many different emergency light batteries as well as lamps and all the parts you would need to keep it all running smoothly. Emergency lighting for people in a commercial building situation is critical; we want to help you with the best products to keep people safe. If you are looking for more significant quantities of these lights, let us know that too, and we can get you a quotation for a bulk purchase.